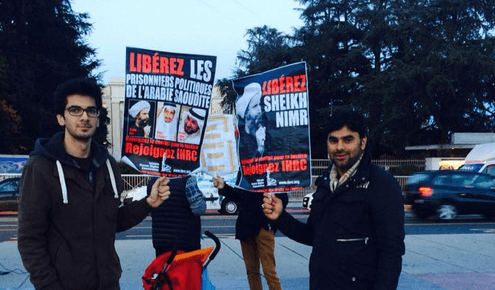 As soon as news came in last month that Sheikh Nimr had received a death sentence, many Muslims were concerned and showed a desire that something should be done in Geneva. IHRC and the Fondation Islamique et Culturelle d’Ahl-El-Beit (FICA) decided to jointly organize a demonstration in front of the United Nations, Palais des Nations, next to the famous icon of the city, the “broken chair”, symbolizing land mine victims. IHRC’s UN Liaison Officer, Jawad Husain contacted the local authorities and the local police to seek authorization to demonstrate on that spot, to use banners and to use a mike and loud speaker. After many phone calls and e-mails with the police calling and instructing what would be permitted during the demonstration, permission was finally granted to demonstrate next to the broken chair in front of the United Nations. IHRC and FICA then publicized the event through mailing lists, phone calls and social media tools like Facebook, Whatsapp and Twitter. IHRC got word of support from Mr. Numan Baltaci of Global Network For Rights And Development (GNRD) and Mr. Xavier Carlo of the Communist Party of Geneva and they distributed IHRC’s announcement. Banners already used in London by IHRC were used in Geneva with banners with the exact pictures in French. IHRC’s printers in London supplied banners in both languages. After many days of rain, on the day, Thursday 13 November the sun showed up even though the temperature was low. Around 30 to 35 people showed up, Muslims from different nationalities and even neighboring Lausanne and as far as Basel showed up for the event, Afghans, Iranians, Indians, Pakistani, Iraqis, Lebanese, .united to protest the death sentence of Sheikh Nimr and demanded the freedom of all political prisoners in Saudi Arabia. Mr. Mahdi Jahandar gave some background on Sheikh Nimr and the persecution inflicted against him by the Saudi regime.He also spoke about media bias on being obsessed with Iran but neglecting to focus on Saudi Arabia’s gross human rights violations. IHRC’s UN liaison Officer, Jawad Husain read out IHRC’s press release for the event, especially expressing concern that Saudi Arabia, a member of the United Nations Human Rights Council would contemplate the barbaric punishment of crucifixion against Sheikh Nimr on trumped up charges. Although rumors are coming that the King of Saudi Arabia may have suspended Sheikh Nimr’s death sentence, IHRC and FICA feel that the pressure on the Saudi government needs to continue so that Sheikh Nimr is released as well as all political prisoners and that there should be political reforms in the country to bring about more democracy and to allow freedom of expression and freedom of association.